Tuesday, Dec. 4, 1888 Mercury 54° P.M. mild & pleasantest for sometime. 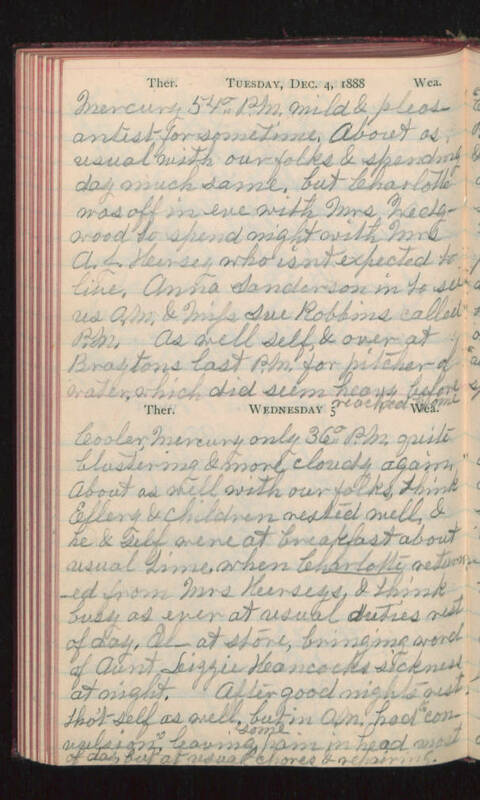 About as usual with our folks & spending day much same, but Charlotte was off in eve with Mrs Wedgwood to spend night with Mrs A. F. Hersey who isn't expected to live. Anna Sanderson in to see us A.M. & Miss Sue Robbins called P.M. As well self, & over at Braytons last P.M. for pitcher of water, which did seem heavy before reached home. Wednesday 5 Cooler, Mercury only 36° P.M. quite blustering & more cloudy again. About as well with our folks, think Ellery & children rested well, & he & self were at breakfast about usual time, when Charlotte returned from Mrs Hersey's & think busy as ever at usual duties rest of day. El- at store, bringing word of Aunt Lizzie Hancodk's sickness at night. After good nights rest tho't self as well, but in A>M. had "convulsion" leaving some pain in head most of day, but at usual chores & repairing.